You can die in the game, but not often, and the game immediately restores you to the point before your demise. Load times for the restores are fast. Does not require a powerful video card - card needs only 32 MB of video RAM, doesn't need T&L capability. The Egyptian Prophecy takes place during the reign of Ramses II. The story is unrelated to that of the two other Egypt-themed games that are published by The Adventure Company, so you can play the games in any order. Historically, Ramses II had one of the longest reigns in Egyptian history, from 1279 BC to 1212 BC (or thereabouts). He was also one of the great builders. He built several temples, including the famous temples at Abu-Simbel which he constructed for himself and his favorite wife. In The Egyptian Prophecy, Ramses II has fallen ill. 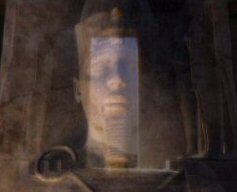 In exchange for having a temple built in his honor, the sun god Amon-Re will extend the life of Ramses II. But there are problems. Several accidents have occurred on the building site which have delayed construction. In addition, the overseer in charge of building the temple is injured and has mysteriously become victim to an unexplained illness as well. If the temple is not finished in time, the Pharaoh will die. Your character in The Egyptian Prophecy is a young priestess named Maya. It is hoped that Maya's gift of clairvoyance will be of service in uncovering the mystery of why the accidents are occurring. Only if the source of the evil that is plaguing the temple is uprooted can the temple be completed and the pharaoh saved. In the world of The Egyptian Prophecy, magic is real and the ancient gods of Egypt actually exist. The visions Maya has, whether induced by a preparation of mystical incense or some other means, allow Maya to enter fantastic worlds where she can communicate directly with the Egyptian gods. The gods cannot act directly on the physical world of Egypt. But what Maya does in these dreamworlds will effect what happens in Egypt. Sometimes the gods test her worthiness to receive their assistance, which leads to some of the more unusual puzzles in the game. They may reward her with information or by causing some event to take place in the physical world. Maya's occasional trips into the dreamworlds give The Egyptian Prophecy more variety of locale than the previous Egypt games. Egypt 1156 B.C. and Egypt 2: The Heliopolis Prophecy both took place entirely in desert areas and oases with a lot of sand and desert foliage. But in The Egyptian Prophecy your visits to "real" places like Memphis, Aswan, and Pi-Ramses are intermingled with visits to imaginary places, such as the beautiful moonlit lake garden where Isis appears, the lava-filled world of Ptah, god of the forge, and the Book of the Dead, realm of Osiris, where the "floor" appears as an enormous piece of parchment suspended in space, with narrow strips of hieroglyphs moving vertically in the distance against a starlit sky. Since Maya visits these imaginary places in visions, the effect isn't wholly unrealistic. And these dreamworlds provide a setting for puzzles that would not make sense in the physical world of Egypt. The Egyptian Prophecy has two install sizes, 1.3 GB and 1.9 GB. The 1.9 GB size is a complete install to the hard drive, but you will need CD3 in the drive in order to start the game. The installation gives you the option of installing DirectX 9 if you want it. But the game worked fine for me in Win 2000 with DirectX 8.1. The Egyptian Prophecy is mouse-controlled. Movement is node-based point-and-click with panning available at the nodes. Panning is of the edge-panning type, where your view doesn't start to pan until you move the cursor close to the edge of the screen. There are three panning speeds. On "normal" speed, panning was easy to control on the 1533 MHz computer I tested the game on. This is an improvement over the first two Egypt games, where the panning speed moves like greased lightning if you play on a computer with much more than the recommended specs. Right-clicking toggles the appearance and disappearance of the inventory bar at the bottom of the screen. In the center of the bar is a group of four icons which allow you to access the zoom icon, a list of your goals, the historical documentation, and the save/load Menu. The list of your goals updates itself as you progress in the game and keeps a record of what you've done. To use the zoom icon, you click it, then click an item in your inventory in order to get an enlarged view of it as well as a (usually) augmented description of it. The Menu you access from the inventory bar has selections to Save, Load, adjust Options, Return to the Game, and Exit (to the Main Menu). The Main Menu has selections for New Game, Resume Game, Load Game, Options, Documentary Database, Credits, Victory Diary, and Exit. Victory Diary does not become available until after you complete the game and is the same as the list of "Goals" you can access while playing the game. To the left of the central group of four icons is your inventory. If you run your cursor over an item in the inventory, a short text description of the item will appear and identify it for you. Eight inventory items can be displayed at a time. Small arrow icons will allow you to scroll up and down if you get more than eight items, but the inventory tends to be self-cleaning and you rarely have more than eight items for very long. When you pick up an inventory item from the gameworld, a little icon appears in the upper left of your screen and you hear a little tinkle that lets you know you've picked something up. Usually you know when you click on something, but the icon and the tinkle will alert you if someone you are talking to gives you an item. To the right of the central group of four icons are your spells. Before you acquire them, you'll see ghost images of them. You start out with only the Wadjet Eye of Clairvoyance and acquire the others as you progress in the game. To use the Eye, you open your inventory, click on the Eye icon, then click on the object or person you want to use your clairvoyance on. Sometimes you can see things with the Eye that you can't see without it. And sometimes the Eye gives you no information and Maya simply says "I can't see anything." The Eye may reveal hidden objects or it may tell you what kind of a person someone is. One of the more amusing details of the game is that if you use the Eye on some especially stubborn or stupid person, Maya will say, "I see a donkey." This happened right after I was thinking what a jackass a certain character was. Maya receives new spells as the game progresses. You use other spells in the same manner you do the Eye, by opening the inventory bar, clicking on the spell, and then clicking on the object you wish to use the spell on. In other words, you use the spells the same way you use inventory - only the spells don't disappear when you use them. Conversations occur when you click on a character who has something to say. For the most part, conversations are straightforward. You are given anywhere up to five questions to ask at a time. Sometimes a question will lead to a new group of questions, but you have ample opportunity to ask things. The game never eliminates choices until after relevant puzzles are solved. Usually you can repeat questions, if you don't catch what was said the first time (a feature I appreciate). Subtitles are optional. Right-clicking or using the spacebar will skip cut scenes and conversations. The Options menu includes settings for Video acceleration (hardware or software), Color (32 bits or 16 bits), Speed of panning (fast, slow, or normal), Volume, Subtitles (yes or no), and Return. In hardware mode, only the 32 bit color option is available. Graphics are displayed full screen in 32-bit or 16-bit color in 800x600 resolution. They are very sharp and often colorful. The Egyptian Prophecy uses a brighter palette than Egypt 2. Even in locations like the inside of a hut, there was more color in the objects placed around the rooms. Egypt 2 may have been more "realistic," but The Egyptian Prophecy is more interesting to look at. The Egyptian Prophecy also has more animations. The cut scenes loaded quickly and ran smoothly on my test computer. Unlike the rest of the game, the cut scenes are in a sort of "widescreen" mode, with black areas above and below the image. Voices are mostly good - competent, though not exceptional. They tend to be a little cartoonish in the case of a few of the characters. Sound effects are excellent. Some sounds are emphasized or have resonance enhanced to give the feel of a large interior space. Music does not play all the time and is well integrated into the game. Though I don't remember any particular theme, the music always seemed appropriate. At times music will become more threatening or more mysterious for dramatic effect. When you complete a puzzle, the music will often change to signal your success. When there is no music, there are usually background sounds. These are also very well done on the whole, though in one area I wished someone would feed the cat. It wasn't a very loud cat, but it was insistent. Most of the puzzles are of the type where you know you need to do something, so you look for an object to do it with or look for a person to ask for information on how to do it. There is not a lot of moving back and forth between game locations in order to complete puzzles. Most inventory can be found not far from where you learn of your need for it. When you have to travel to a different location in order to talk to someone, there are usually several things to do in that location before leaving. In fact, the game won't let you leave the area until you've finished what you need to do. There are three or four timed puzzles, none of which is particularly difficult once you've discovered what you need to do. One of these puzzles involves timing. Although you can be killed, the game immediately restores you to the point before your big mistake. Load times for these restores are very fast. Sometimes they were almost instantaneous on the 1533 GHz computer I tested the game on. In addition to the inventory and conversation-based puzzles, there are a few mechanical types. There is one slider - not the type where you move a tile around but the type where you move whole rows or columns of tiles at once. In the realms that Maya visits in her visions, there are other types of mechanical puzzles. Most of these were interesting, fun, and not overly difficult. There is one very easy sound puzzle, which can be solved by process of elimination if you absolutely can't do sound puzzles because there are only six configurations to test. There is one puzzle near the end of the game which rivals the bridge puzzle in Schizm: Mysterious Journey in difficulty level. Like the puzzle in Mysterious Journey, it is more like a board game that you play against the computer than a puzzle. Also like the puzzle in Mysterious Journey, it takes a combination of strategy and luck to win it. Unlike the puzzle in Mysterious Journey, there seems to be a repeating solution for it, so those who cannot solve it on their own will be able to find comfort in a walkthrough. The encyclopedia that comes with The Egyptian Prophecy is attractively laid out and intuitively organized. I found it much easier to navigate than the one in Egypt 2 because the headings stayed at the top of the page even when I clicked on a connecting link within the description. Having the headings always available made it easier to get back to the subject I was reading before I checked out the link. The encyclopedia can be accessed through either the Main Menu or the inventory bar. It is easily navigated through tabs at the top of the screen. You can read about the construction of temples and how symbolism was important in their layout. The role of the priest-architect and other people who worked on temple construction is explained. There is information about how obelisks were quarried, transported, carved, and erected. Other subjects include details of the life of the pharaoh Ramses II and some of the monuments he constructed. There are brief descriptions of the Egyptian gods that are seen in the game. Rituals used in healing and magic are described. The text in the encyclopedia is accompanied by pictures that relate to the descriptions. I would have preferred that the font were a little larger, but that may be just me. On a 19" CRT monitor it was legible, but I think I'd have had trouble reading it on a 17" monitor. For the most part it is not necessary to consult the encyclopedia to play the game, though there is one puzzle for which it seems to pop open automatically to give you a clue. The Egyptian Prophecy is more an adventure game with an encyclopedia available if you want it than it is an edutainment game. Probably the only thing I will remember from the encyclopedia is that Amon and Re were originally separate gods, Amon being "the hidden god" and Re the sun god. Later they were combined into one god, Amon-Re. And that's why he has a hyphenated name. The game froze during a reloading of the puzzle near the end of the game - the one I previously mentioned as being particularly difficult. I shut down the game using Alt-F4 and immediately reloaded. I had no further problems with the game. Considering that this was the only real tech problem I had with it, and how many times I reloaded the puzzle without incident, I'd say the game was very stable. I was surprised by how much I enjoyed The Egyptian Prophecy. I'd been expecting "another Egypt game" that was very similar to the previous ones I've played. But The Egyptian Prophecy was more fun to play than any of them. Having the heroine occasionally enter dreamworlds to solve puzzles made the gameworld more varied than having her confined exclusively to the arid world of Egypt. And some of the more interesting puzzles were in the dreamworlds. I was also impressed by how the game contrived to make magic seem believable. Maya's interactions with the gods in the imaginary realms had real consequences in the physical world of Egypt. Yet the magic was not so overtly fanciful as to make the game seem unrealistic. The game seemed to do a good job of avoiding dead ends. The game is linear in that it won't let you leave an area until you have all you need. It does not force the gamer to do a lot of back-and-forthing across the gameworld. This is part of the reason the playing time is not as long as in some other games. My brother and I finished the game in 3 days, averaging between 2 and 3½ hours a day. The only time we were really stuck for very long was when we neglected to look upward when searching for hotspots. One of the frustrations we encountered was searching for inventory and finding we could not interact with things. For example, we needed a bowl, we could see a bowl, but we could not pick it up. Or a stick. Or a ladder. There was a lot of detail in the game screens that could not be interacted with. There were a lot of interesting things we'd have liked to do in the game environment, but our actions were limited to a few hotspots. This made the game easier in that there were fewer wrong solutions to test. But it also made for a shorter game. The Egyptian Prophecy isn't a very long or difficult game, but there is much to enjoy about it. Part of the reason for its relative shortness is that it avoids having the gamer traipse back and forth across the gameworld in order to solve puzzles. I'd recommend it to new adventure gamers or to more experienced gamers who want an easier game after completing a hard one. However it isn't for those who want a deep story or challenging puzzles throughout. It's just a fun game.